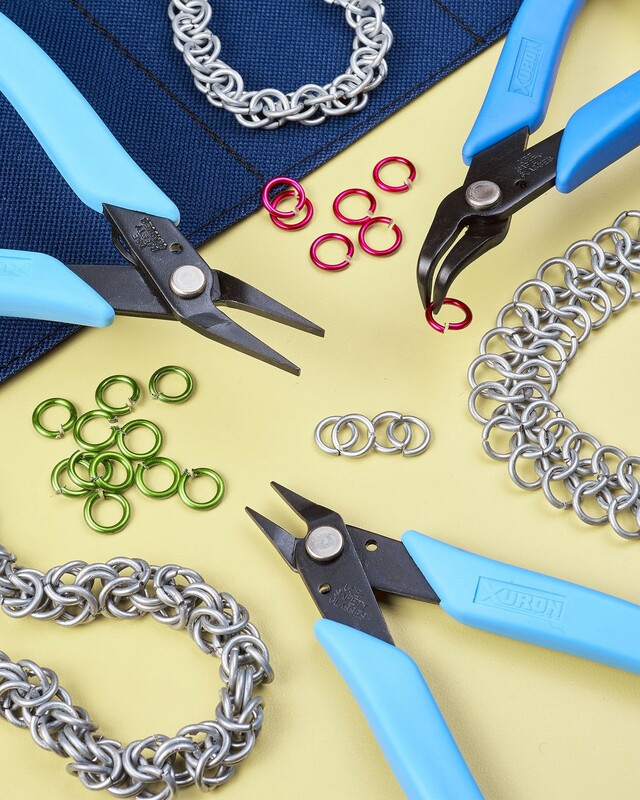 A new Chainmaille plier tool kit designed to let users easily pickup, open and close, and manipulate jump rings comfortably without wrist strain and excessive neck bending is being introduced by Xuron Corp. of Saco, Maine. The Xuron® TK3700 Chainmaille Plier Kit features three specialty pliers that were especially created to enhance user comfort and control. They include the Model 486 plier with a 90° bent nose that lets users pick up jump rings without twisting their wrists, the 475 short nose plier which is ideal for opening and closing jump rings with greater control and better sight lines, and the 485FN flat nose for heavy wire and steel jump rings. Especially designed to enhance user comfort and control when creating and repairing chainmaille, the Xuron® TK3700 Chainmaille Plier Kit comes packed in a handy canvas pouch with pockets to protect each tool. The durable tools are made from high carbon steel which is blackened to prevent glare and they have ergonomic handles with soft Xuro-Rubber™ cushioned hand grips, and Light-Touch™ concealed return springs. The Xuron® TK3700 Chainmaille Plier Kit sells for $53.50 (sugg. retail) and is made in the USA. A catalog is available at www.xuron.com or by request.